Eagle Rare seems to have changed hands a few times in its history. Starting off in the ’70s as a Seagram brand, the bourbon is now in the hands of Buffalo Trace Distillery – and that’s a good thing considering they produce some of my favorites like W.L. Weller and Buffalo Trace. By all accounts this seems to be a classic bourbon aiming for a classy slot on the shelf yet comes in cheaper than I’d expected. 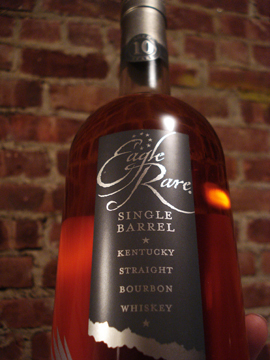 The first descriptor that comes to mind for the Eagle Rare line’s packaging is ‘boring’. From the neat outlines of the bottle and labeling to the etched image of the eponymous bird, this bourbon does not excite much interest. It has something of the air of a scotch, but with just enough jingoistic hints to make it a disappointment. The text on the rear label doesn’t help much – it compares the liquor to both the Declaration of Independence and “a fine port wine”. Come now Eagle Rare, stand on your own legs. The best thing I have to say about the packaging is that they chose a nice foil with which to cover the cork – I do appreciate a good foil. Let’s see what this distilled patriot of ours does in the glass. ERSB smells immediately like almonds and leafy vegetation, but there’s a little must in there too. It’s a sweet scent over all and definitely not overpowering. All in all it has a pleasant nose and very smooth. It’s a very different beast on the tongue however. All bright citrus and oak with a sunny disposition that lasts for a decent amount of time. That is a little strange now that I think about it, the finish is not so much spice or oak, but lemon-drop. If anything, I would say that this is a summer time bourbon. I could drink it alongside a lemonade. Despite the disappointing packaging, the bourbon inside is pretty decent and seems priced about right in the $25 area. I do want to mix a cocktail with it rather than sip it though; might be best suited for an Old Fashioned. Back in full health and back into bourbon blogging – with a well regarded single barrel no less in Rock Hill Farms. I think I may have tried one this a few months ago when checking out a (then) new bar in my neighborhood which was rumored to have an extensive bourbon menu. While the bourbon listing was a little diappointing compared to my lofty expectations, I do recall seeing Rock Hill there and at least discussing it with the bartender, if not drinking it. Either way, I’ve got a bottle of it with me now so I can give it a fresh eye. From a little internet-research, it seems Rock Hill Farms is produced by the Buffalo Trace Distillery, and that’s a good thing. Buffalo Trace is one of the more forward-looking producers these days, or at least their numerous experimental varieties often seem to make their way into my path every now and then with pleasing results. Without any further delay, here we go. The Rock Hill Farms bottle really tries to get across the familiar/cliched sense of Kentucky class. On the one hand, the short square bottle, rounded top corners, and large glass bulb for the stopper make this a bottle that implies it should be placed in a display case. The gold-painted, etched-glass illustrations of horses trotting about, on the other hand, place this bourbon firmly among the bluegrass. There is nothing in the way of descriptive text on the bottle, just the gold and the horses. Presumably the bottle is supposed to speak for itself. I appreciate this in as far as I find most descriptive text on whiskey bottles to be tiresome at best, but there’s also something a little conceited about the whole presentation. We’ll see if it lives up to it. A very pleasant nose to this one – smooth, a bit of maple, and wood that’s been out in the sun for a few years. On tasting it, there’s a very full mouth feel and pretty heavy wood right off the bat. This really lingers on the tongue for a while and develops into a buttered popcorn then a touch of butterscotch and ending with a hint of fresh-cut grass, but really not very sweet for a bourbon. Fortunately, Rock Hill Farms is not nearly as woody as the Elijah Craig single barrel I tasted a while ago. It is definitely not messing around though. This is a luxurious bourbon with a very full flavor that sticks with you for a while. It’s not my favorite, but it’s definitely going to find its way into my glass again. The American whiskey industry’s fetish for nostalgia marketing: it baffles me. It really does. It’s not as if Scottish whisky is branded too differently, but American brands have gone to great lengths to manufacture a – largely imagined – distilling past that involves rugged mountain men hewing a nation out of raw nature. Sure, it’s romantic, and I’m just as susceptible to these narratives as the next guy, but ultimately this strikes me as a destructive practice. We are in the midst of an unprecedented moment: an explosion of variety, techniques, and interest combined with competitive pricing in comparison to Scottish product and a market hungry for innovation. In my mind, brands should be highlighting characteristics that feed this unique postion for American whiskey. Look at Old Potrero and Buffalo Trace. Both are active in driving American liquor production to new territory, actively tweaking and expanding upon tradition to create exciting, new offerings. Yet, at the same time, both brands’ flagship products are painted with a thickly nostalgic brush. They should be coming out and trumpeting their innovation to the broader market, rather than the Malt Advocate crowd alone. This leads me to this week’s tasting: Bulleit Bourbon. At first glance, Bulleit leans heavily on nostalgia. From the serrated label, to the blocky font, to the medicine-flask bottle, they would have you believe that they dug this out of old Augustine Bulleit’s grave. In fact, none of the copy on the bottle speaks to what the product inside might be like – it is entirely devoted to convincing the consumer that this whiskey has a long history and has never changed. The most telling indication of the nostalgic reliance is in the labeling of the product as “frontier whiskey” – as if this bottle was produced in the days of nascent American whiskey production. 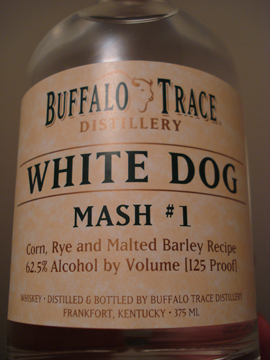 Upon first opening the bottle is a gentle, sweet nose with a not-insignificant corn presence. Goes with their “frontier whiskey” claim, certainly. The full nose is not too different from the initial impression: sweetness, corn, some latex. I was a little surprised by the lack of charcoal and post-rain freshness to it. 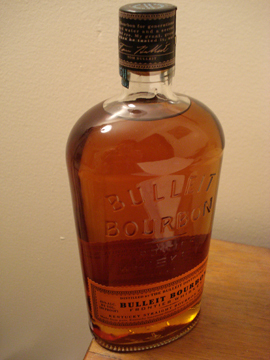 Upon drinking, Bulleit is largely unassuming. It begins and ends quietly, with a clean sweetness throughout. There is less corn on the tongue than in the nose and there is a noticeable flash of not-altogether unappealing must in the middle. This is certainly drinkable, but all in all is a little boring. Clearly, Bulleit has focused all effort on making their product fit into the correct nostalgic category. They would be better served focusing on what they fill the bottle with, rather than what misleading narratives they print on it. I chose Buffalo Trace as the inaugural spirit for this blog on the recommendation of one of the employees at LeNell’s, here in Brooklyn. It was described to me as a no-nonsense, and relatively muscular burbon, but after tasting it, the picture turned out to be a bit more complicated. 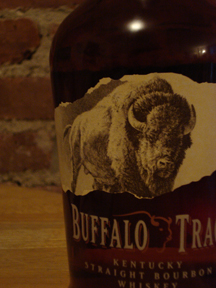 Buffalo Trace relies heavily on a sense of American national nostalgia to sell its product. From the faux-ripped label, to the back label’s tedious reliance on adjectives such as “bold,” “mighty,” “pioneering,” “tradition,” handcrafted,” and “confident,” this is not a marketing strategy that sees fit to engage in subtlety. The buyer is supposed to imagine himself (it is not geared toward the feminine) as returning to a hardier, purer time when the art of crafting liquor was imperfect yet honored, there were buffalo in Kentucky, and bold men made mighty spirits. I’m a sucker for nostalgia as much as the next guy, but c’mon BT, ease up a bit. Upon first opening the bottle there was an immediate wave of vanilla – sweet and clean. An interesting way for such a “mighty” drink to begin. When drinking, the first bits of character I noticed were a sweetness, wet earth, and what could only be called meaty oak. There was plenty of substance to it, but a much gentler introduction than I had expected. The finish was surprisingly clean but with a bit of a lingering sensation of post-rain spring air, a bit of char, and an almost-floral quality. I was not expecting that in the least. Add a little water and the almost-floral character becomes dominant. I was really surprised by this bourbon. I was expecting a rough-and-tumble whiskey with a healthy whack of (perhaps complex) flavor. In fact, it was far more subtle and gentle, presenting an earthier and friendlier over all character. I wouldn’t say that Buffalo Trace is lacking in strength, rather it surprised me in the depth it displayed beyond the traditional bourbon character. The presentation and marketing irks me a little, playing into the idea that whiskies must represent the past to vodka’s future. Ultimately, the marketing material on the bottle serves mostly to corner the drink into a limiting category of national nostalgia when in fact it seems to be eschewing older definitions of bourbon and looking toward new possibilities – as evidenced by the apparent critical acclaim. This was a good whiskey to begin this blog.